The first stretchable integrated circuit made completely using an inkjet printer was developed by engineering researchers at Michigan State University. It opens up the possibility for low-cost mass production of smart fabric. Visualize this: an ultrathin smart tablet capable of stretching from mini-size to extra large. Or wallpaper that transforms a wall into an electronic display. Or a rubber band-like wrist monitor capable of measuring a person’s heartbeat. These are a few of the potential applications of the stretchable smart fabric created in the lab of Chuan Wang, assistant professor of electrical and computer engineering. Since the material can be created on a standard printer, it has a huge potential cost advantage over existing technologies that are not economical to manufacture. We can conceivably make the costs of producing flexible electronics comparable to the costs of printing newspapers. Our work could soon lead to printed displays that can easily be stretched to larger sizes, as well as wearable electronics and soft robotics applications. The smart fabric is composed of a number of materials fabricated from organic compounds and nanomaterials. These compounds are dissolved in solution to create different electronic inks. The inks are run through the printer to develop the devices. Wang and his team, using the ink, have successfully developed the elastic material, the circuit and the organic light-emitting diode (OLED). Combining the OLED and the circuit into a single pixel is the next step. Wang estimates it will take one to two years to accomplish. There are normally millions of pixels just below the screen of a large display or a smart tablet. After the researchers effectively combine the OLED and the circuit into a working pixel, it may be possible to commercialize the smart fabric. 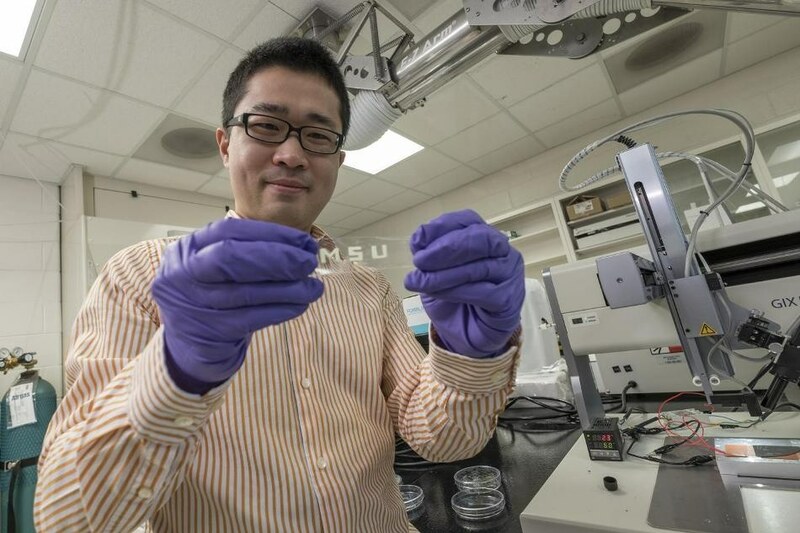 Wang explains that the stretchable electronic fabric can be folded and placed inside a person’s pocket without breaking, which cannot be done with existing “flexible” electronics material technology. We have created a new technology that is not yet available, and we have taken it one big step beyond the flexible screens that are about to become commercially available. An article about the innovative discovery of the ink-fabricated stretchable circuitry was published recently in the ACS Nano journal. Wang’s co-researchers were Le Cai, Suoming Zhang and Jinshui Miao of MSU and Zhibin Yu of Florida State University.